Bridge Café. Contemplating what life was like when this great old building was the original train depot, we’re thinking, how much has changed in this sleepy town, since the train stopped running. The great old vintage buildings are still intact. You can see some evidence of the business and industry of the past in faded paint on the rusty old brick walls. But there is new life here now and Schmutzerland is happy to be a part of it. You can find our jewelry in Modern Love. on Bridge Street. 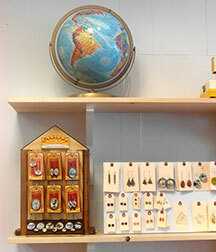 Run by the ever-fascinating Megan Metz, this store is one of the best-curated shops we have seen. Artfully combining new and vintage things from clothing to cards, jewelry to those fantastic accessories you might not need, but just have to have. She has great old typewriters and take a look at her collection of vintage miniature sewing machines. 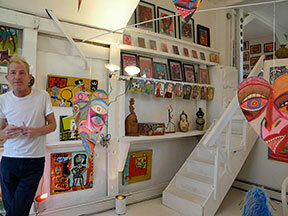 No visit to Frenchtown is complete until to go to the Outsider Art Gallery. This gallery is a tribute to the soul and spirit of American artistic ingenuity. Run by Dion Hitchings, who has graciously allowed us to put his original artwork in jewelry, this space showcases work by untrained artists that use the world of the visual to express their inner most feelings. Here you can see and buy work by a group of artists called the “A Team” from the Trenton Soup Kitchen, as well as works by artists that use found objects to tell their stories and ideas. Dion’s heart felt enthusiasm and feelings for all of his artists is evident after hearing him describe each artist’s situation and inspiration. Another Frenchtown must see is Two Buttons. This world famous shop, owned by Liz Gilbert the “Eat, Pray, Love” author and her husband Jose. They travel the far reaches of the world to bring back beautiful, spiritual and artistic objects. From Buddhas and Eastern Deities to wall hangings and furniture, their warehouse is like a museum, but you can take the exhibits home. We keep our Two Buttons prosperity stone in a special place in the living room. well look no further than the Delaware and Raritan Canal State Park. The path along the old canal and train line is one of the most scenic New Jersey bike trails in the state. Starting right in front of the Bridge Café, where we had our coffee, you can bike south along the Delaware River to Lambertville, NJ and cross over to New Hope, PA. That’s about 18 miles one-way, but there are some great little towns along the way to explore. Rent your bikes at Cycle Corner (http://www.thecyclecorner.com), they will set the whole family up. If it’s hot, rent a tube and float down the Delaware (http://www.delawarerivertubing.com). They will even pick you up at the end of the trip and bring you back. You can also get a Kayak at Paddle Creek on Race Street. They have everything you need and then you’re off. Go on your own or with a tour, a great way to spend the day. 1. The Bridge Café, you had your coffee maybe breakfast there, but dinner is great too. 2. The Lovin’ Oven (http://www.lovinovenfrenchtown.com). Right next to Two Buttons, a Schmutzerland two thumbs up here. This is a great choice for vegetarian and vegan selections, but the omnivore will also leave happy. 3. The Frenchtown Café (44 Bridge Street) has Frenchtown history on view. Under the glass on your table are pictures of historic and nostalgic Frenchtown, You’ll be so interested, that when your food comes you won’t want the plates to get in the way of your history lesson. Breakfast and lunch only. 4. 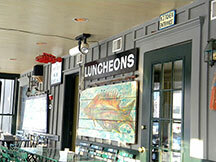 River Blue Café Great for the family, everything from sandwiches to full meals. Sit outside and watch the street view. 5. 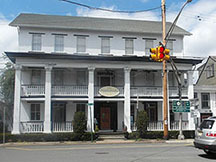 The National Hotel (http://www.thenationalhotelnj.com). They have a great bar and restaurant as you walk in on the first floor. River dining at its best happens in this historic old Hotel. If you want to spend a weekend in Frenchtown, this is the place to stay. For nightlife go downstairs to the Rathskeller. On our last visit we saw our favorite band, The Son of the Original Synthetic Swampgass Jug-Band.com. It’s a good thing that the hotel is built on a solid old stone foundation, because they would have brought the place down. Frenchtown, NJ is great for a day trip from New York or Philadelphia with lots of interesting shops, things to do and see. Take a ride out there; it’s some of the nicest country in New Jersey.